Surf Guiding is one of our most popular surf packages. It provides you with a local Surf Guide who will take you to the best waves for your surfing ability. As the most established surf travel operator in Morocco we’re well setup to host every level of surfer from beginners to pro’s. Whether you’re here on holiday and want to surf unknown spots or shooting with a film crew, we’re able to accommodate your needs. Our local guides and team of hospitality professionals will ensure your trip goes smoothly so you can concentrate on scoring perfect waves. 08.45 – Discuss the surf conditions and options for the day. If you want to stop surfing at midday, do another activity, surf early, relax at the accommodation and then get a sunset surf session, or any other variable, then we’ll happily arrange that for you. All of our Guides have invaluable knowledge of the Moroccan coastline and are proper locals – they know exactly what breaks are working and when. To get around, we have a fleet of vans and 4×4′ s equipped with FCS auto accessories, safes for valuables, and medical kits. We are the only company in Morocco to operate 6 level groups, which means you always get the best possible waves on offer and never have to surf waves too big or too small, too slow or too fast or be sat watching or wondering if its better at another spot. In and around Taghazout we have a multi aspect coastline, which provides a range of different surf spots that work for any given tide or swell – we have waves for all surfing abilities for beginners to pros. To ensure you get to surf waves suited to your ability we implement a surf levels system. This helps us pair you with a surf group seeking the same type of waves. Our team of professional surf guides and system of levels sets us apart from other surf camps in Morocco. You’re an advanced surfer and competent in all conditions. Each day your guide will search for the best waves the area has to offer. Expect very long powerful point breaks, A-frame reefs and hollow beach breaks. Our guides are complety focused on finding the best possible conditions on the day regardless of distances needed to travel to find them. You are comfortable in small to medium sized reef, point and beach breaks. At level 5 you’re able to surf all the spots in the local area just not too big and scary. Each day our guides will assess the conditions and get you to the best, uncrowded waves. You’re outback at beach breaks catching green waves up to head high. Our guides will find you clean and mellow breaking waves and if the conditions permit we will take you to sand bottom point breaks. You’re out back, progressing onto green waves, standing up and turning. At level 3 the emphasis will be on finding clean green waves with a mellow shape for you to progress on. You will be surfing sand bottom beach breaks only. We highly recommend our Surf Coaching package if you’re a level 2 or 3 so we can fast track your progress and make the most of your holiday. You’ve surfed before, know the basics and are practising surfing in the white water. At level 2 our Surf Guides will focus on finding you safe and manageable waves in the waist to shoulder high range. At level 1 we don’t offer our Surf Guiding package. It’s best you book our Surf Coaching package that included with lessons. Click here for more information. 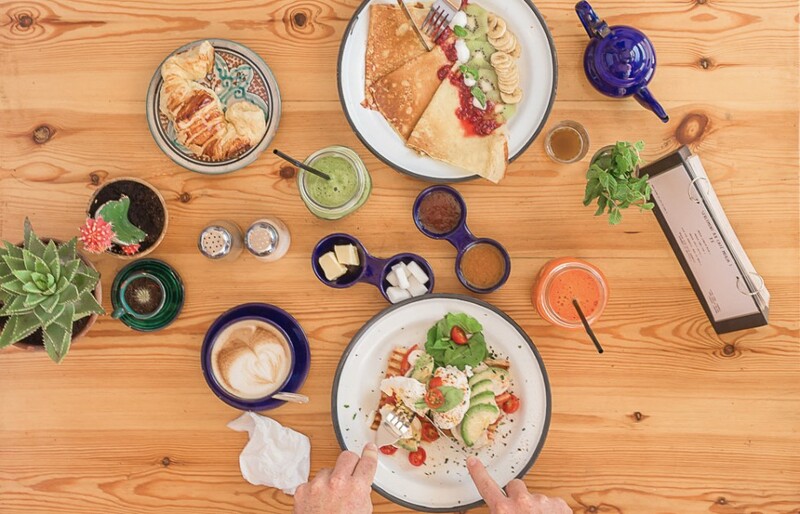 At all of our locations, we serve a mix of Moroccan inspired dishes alongside international classics and everything is freshly prepared by our chef using locally sourced seasonal ingredients. For breakfast and dinner guests feast together at sharing tables located on the terrace overlooking the surf. For lunch we provide you with a packed lunch for the beach. 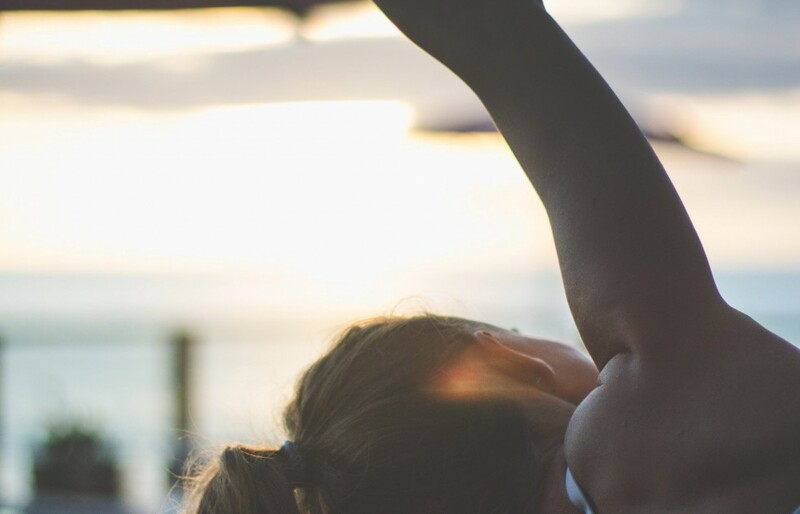 We have three in-house yoga teachers, who offer inspiring, uplifting, and fun yoga classes for all abilities. 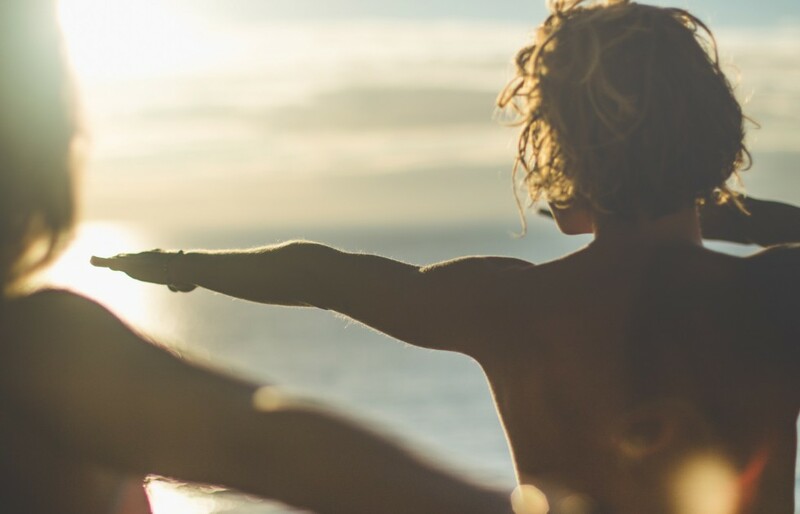 Yoga goes hand in hand with surfing in our opinion and it’s an important part of the Surf Maroc ethos; we take it seriously and operate one of the best yoga retreat centres in Morocco. Our fantastic teachers expertly blend Core Power Yoga, creative Vinyasa Flow, Anusara, Hatha, Restorative and Yin Yoga. We run 2 open yoga classes every day at Amouage from 7 – 8 am, 6-7pm as well as three workshops three times a week 4.30-5.30pm (days can vary). Private classes may be arranged on request from 500MAD/£40 per hour. The surf guides are great and add a real insight into the region and the local spots, their enthusiasm and energy are always refreshing. 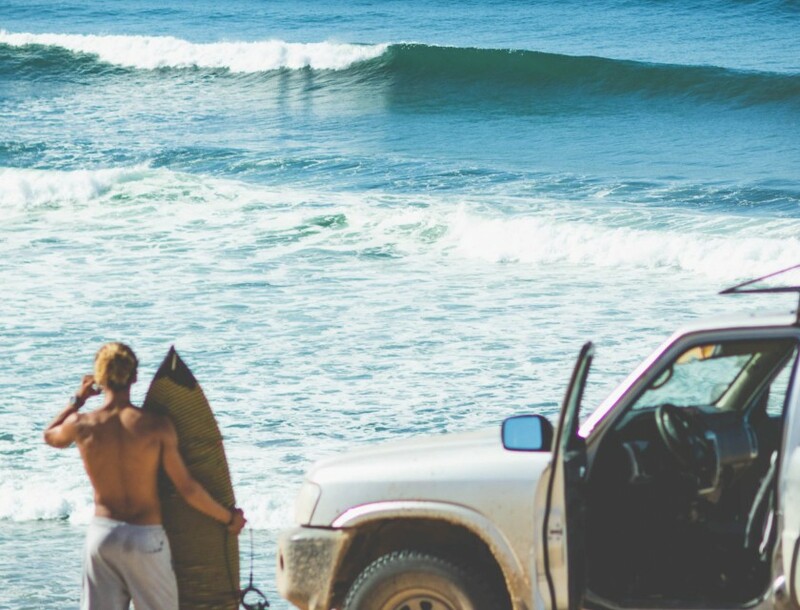 Perfect surf trip friendly buzz good times no hassles! If you're thinking of booking: just do it already. I loved every minute of my stay. Good surf, good food and good people. If your looking for a quick and easy get away to rewind the senses or get your mind blown by some of the best rights in the world look no further, Surf Marc accommodates everything. The surf guide team are really good allowing access to all the point breaks surrounding Taghazout (of which there are many) all guides are surfers themselves and most of them locals, really relaxed and willing to take you anywhere. 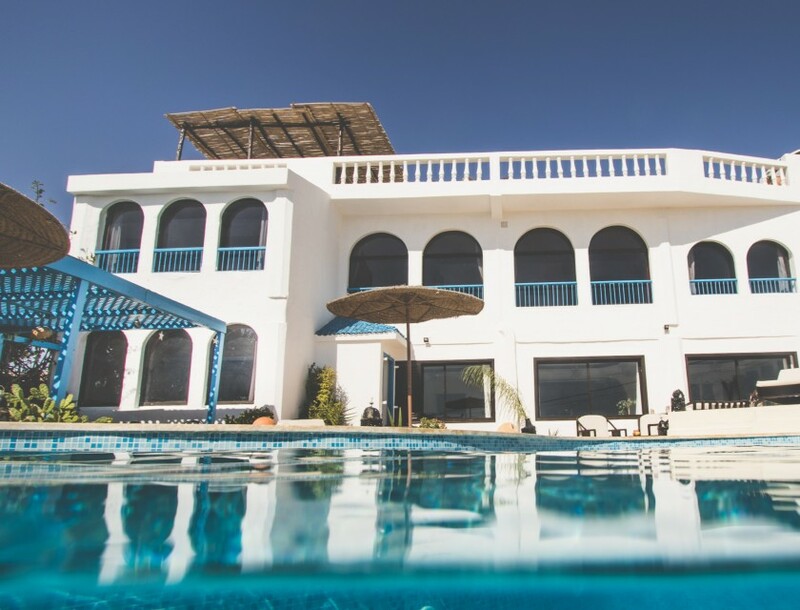 Don't bother travelling independently and waste time and money getting to and in the best breaks in the area, Surf Maroc have it all covered. The surf guiding is second to none. Are surf lesson and equipment included ? 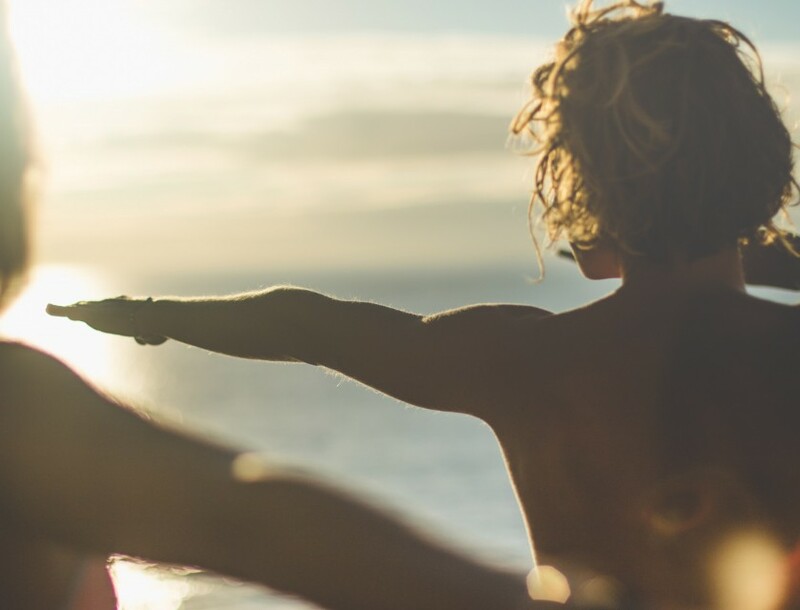 No, surf coaching is not included in the surf guiding package. If you would like surf coaching please see our Surf Coaching package for more info. Equipment is not included as some guests like to bring their own so we have made it an optional extra. What sort of waves will I surf ? Please see our levels section and also our spot guide on the Surf page. Can I go surfing later / can I do a half day? We will always try to adapt to what you would like to do. If your group is surfing nearby your guide will come to pick you up. If they are more than 5 mins drive away it might be more difficult for the guide to leave the group for safety reasons. We will organise a car and driver in this situation if possible but it cannot always be guaranteed. Can we go on a excursion in place of our guiding package ? If the surf is bad or all of your group want to go on a local excursion your guide can take you to Agadir or Paradise valley. Please note even if only one person in your group wants to surf our priority is to the surfers. In this case, we can arrange excursion but costs will apply. Please see the excursion section on the About page. What's the surf going to be like? Please see the season guide and the surf forecast section on the Surf Page. Please see the season guide in the surf page! Can I change my surf level group? Absolutely. If you feel you need to move up or down a group/level just let your host know the night before and we can get you into the appropriate group the next day. Surf Maroc is located in the Agadir region of southern Morocco. 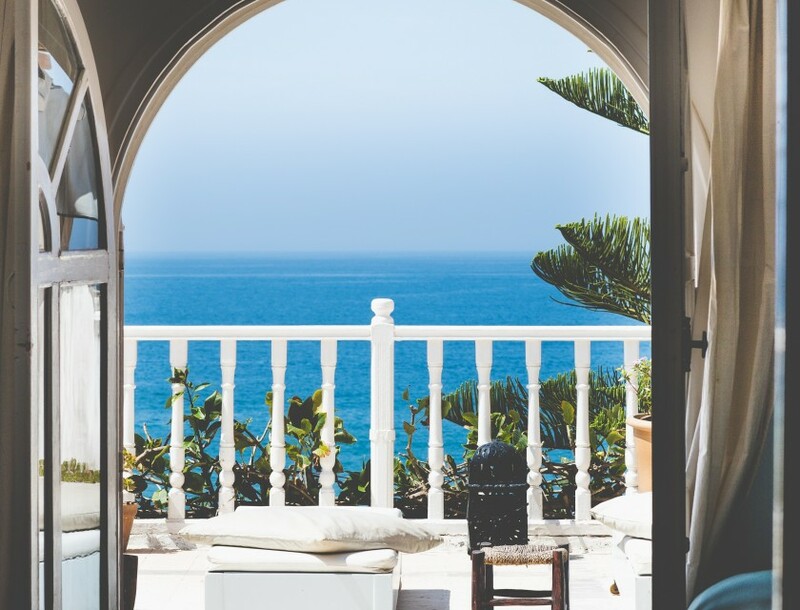 Taghazout is a unique gem on Morocco’s Atlantic coast. Conveniently located 40 min from Agadir international airport it’s a short hop ( 2-4 hrs) from most central European cities. It’s the closest place for any European surfer to get year round warm water, perfect waves and a unique cultural experience. Morocco is served by direct flights from the UK and other major European airports, with flight times to Agadir between 2-4 hours. Guests travelling from the US can connect either in Casablanca or at a European airport as there are no direct flights to Agadir. From Agadir airport, it’s a 45-minute drive south-east along the coast road. Road transfers from Marrakech can be easily arranged and the new motorway has dramatically cut the journey times down to 2 -3 hours and cost approx £80 for 4 people. Surf Maroc do not provide these transfers but can book one for you. Payments for the transfer are made directly to your driver. Skyscanner – great site to see who fly where internationally. Flights leave the UK from London Stansted (STN) London Luton ( LTN) London (LGW), Manchester (MAN), Bristol (BRS). France is well connected with Paris, Toulouse Bordeaux, Marseille and Lyon all having direct flights to Agadir. Condor and Air Berlin serve central Europe. EU passport holders do not require a visa to enter Morocco for tourist purposes. Your passport must be valid for the duration of your stay. If you hold a passport from outside the European Union we strongly recommend that you check with your nearest Moroccan Embassy. We welcome children to all of our locations. However, at Amouage, families with children under 12 years old are only able to book during the set dates below. Please do check our Children’s Policy in our T&C’s. Can I hire one of Surf Maroc's locations exclusively? Absolutely! Whether it’s a birthday, anniversary, group trip or if you would like to run your own weeks here with us. We can tailor-make a package for you. We facilitate holidays for companies such as Big Friday, WaveHunters USA, Animal Surf Academy, AppleYoga, Yoga Haven, The Saunton Hotdoggers, Access Trips, Liquid Yoga Surf, Rob Barbers Body Board School, Surf Southwest. 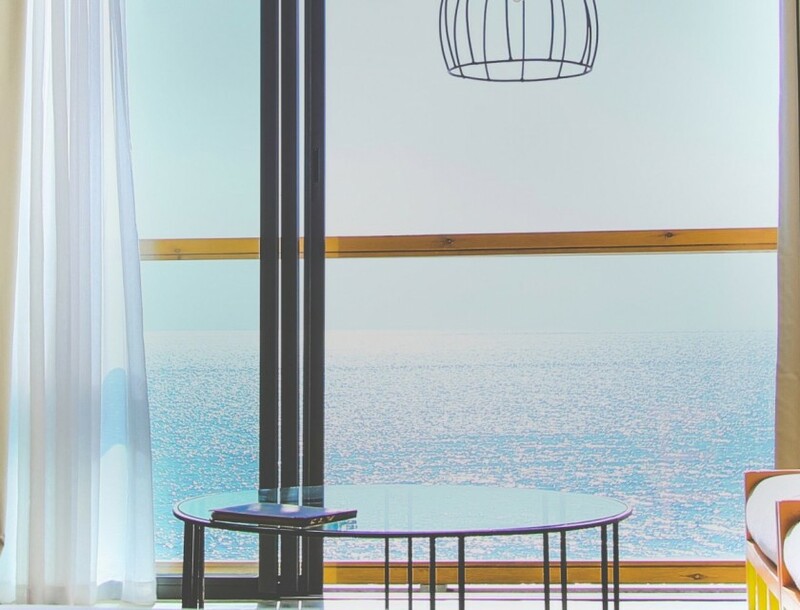 We provide all the accommodation, surfing, logistical, catering and concierge services allowing them to hang out and enjoy the sun, surf and culture with their guests. Can I spend Christmas and New Year at Surf Maroc? Absolutely! Spend Christmas or New Year on the beach in the sun and surf some great waves. Each year we throw a Christmas party and a New Year’s party at one of the venues with all our guests invited. Please note that over this time our locations are adult only. How about cash? What is the currency? Where can I get it? The Moroccan currency is the Dirham. Exchange rates at last time of checking were around 13.5 Dh to the £1, 11 Dh to the € and 7.6 Dh to the $. Dirhams can only be obtained within Morocco. There are exchange facilities and ATMs in the airport. There are also plenty of ATMs in Agadir. There are no ATM’s in Taghazout, the nearest is Aourir, a five-minute drive from Taghazout. This machine and many other ATMs in Morocco do not accept Maestro and can be unreliable, if you have a VISA card we recommend you bring it. *Please note: traveller’s cheques are not a good idea for Morocco. They cannot be exchanged at the airport or in Taghazout and there are only a few places in Agadir that will change them. Nearly all networks work in Morocco. Contact your network for call charges. Coverage is good. There is an abundance of public phones (coin and cards) in Taghazout. International call charges are relatively cheap. There is free wifi available at all our locations. There are also broadband internet cafes in Taghazout. Is the standard of the services the same at each location? At all of our locations, the services are run at the same high standard with the same friendly hospitable staff, new vehicles and state of the art surfing equipment. What is the surf and the weather like? When is the best time to visit? Morocco is an all year round destination for great surf and great weather. Surf Maroc is open all year. The summer months (April – October) see small to medium swells with surf mostly on the beaches and reefs on the more exposed north-west coast. This is a great time for anyone looking for fun, uncrowded warm water surf. There are some bigger days during this time for those looking for something more challenging. During the winter months the waves, that have made Morocco famous, come to life. There is a huge variety of surf in this area of Morocco. There are not many places like it in the world. The region has something for everyone, from ideal beginner waves to challenging reef ledges. Intermediates and those new to the sport should not be put off or worried. Due to the nature of the coastline, there is almost always somewhere sheltered and manageable, and those looking for something challenging won’t be disappointed. Morocco is blessed with well over 300 days of sunshine a year. Between the months November to February, there is a small chance of rain, although statistically, it is unlikely. What boards should I bring, do you rent equipment? With such a large range and choice of waves, you may want to bring a whole quiver of boards. To generalise, the majority of waves are right-hand point breaks from soft, slow, rolling spots to heavy, fast barrelling spots. Bring equipment to suit your ability and what you want to surf. If you don’t want to go big, your everyday board will suffice, there’s nearly always somewhere sheltered. If you do want to charge the big stuff, bring something suitable for mid-winter waves can get up to 15ft. 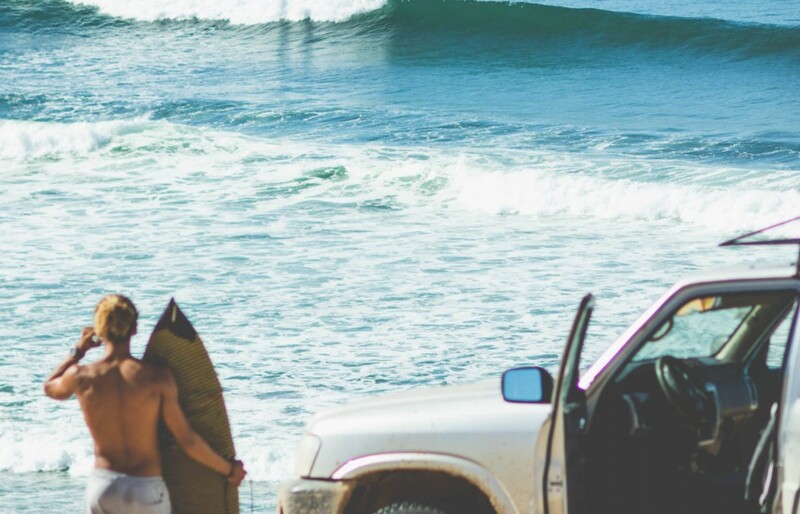 Surf Maroc have teamed up with board and fin innovators SurfTech and FCS to give Surf Maroc guests exclusive access to the Tuflite Travel program and FCS test drive. We have stocked our beach front base in Taghazout with over 40 of SurfTech’s latest models from their extensive range. As well as that, FCS have supplied their cutting edge fins system, it’s a perfect opportunity to experiment with new shapes and fins or use the identical boards you have at home without the hassle and burden of transporting them. 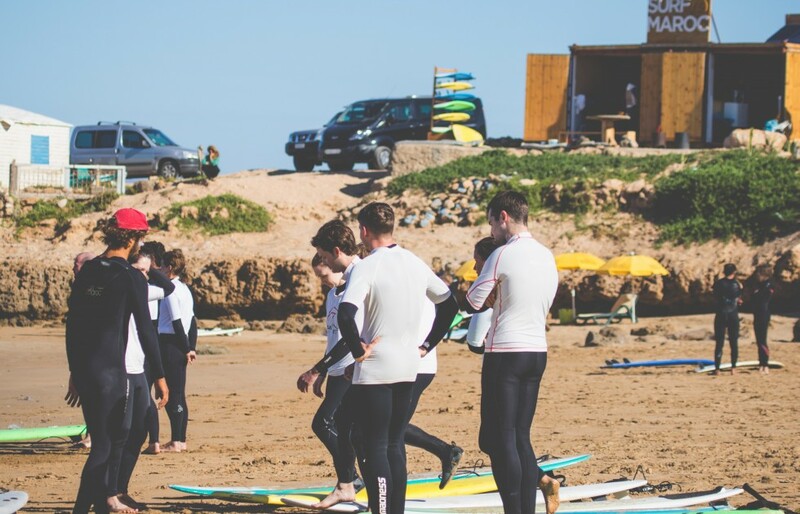 We also have a fully kitted out surf school with every shape and size of boards to get you standing up and surfing. Click here to find the full listing of Tuflite range Click here to find out more about SurfTech Click here to find out more about FCS. What amenities are there in Taghazout? 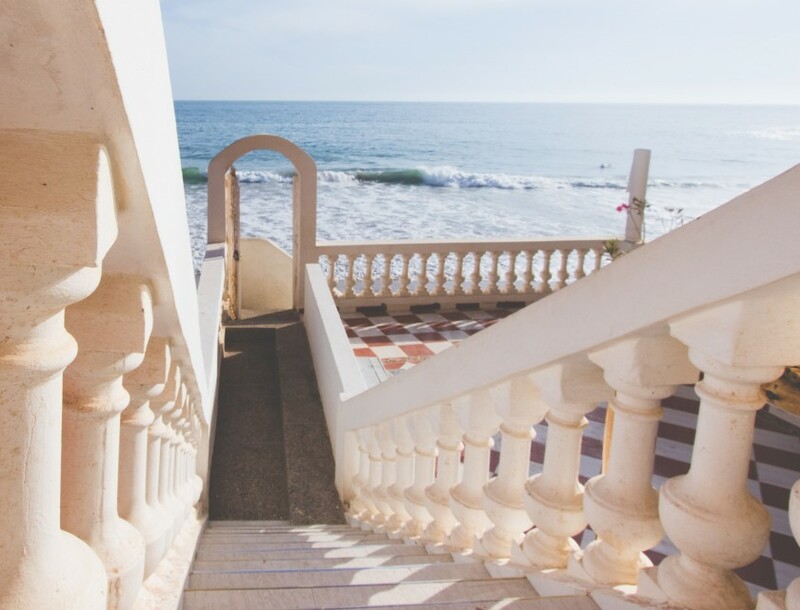 There is an abundance of restaurants and cafes in Taghazout, including our own Auberge restaurant on the sea front and Cafe Mouja overlooking Anchor Point. The are plenty of grocery shops selling fruit, vegetable and other essentials. There is a well-stocked pharmacy and four surf shops. There are also lots of internet cafes with ADSL connection. Alcohol can be consumed at our fully licensed bar, Amouage Bar & Kitchen. Are there surf shops in Taghazout, what can I buy there? There are surf shops in Taghazout. They now stock a fair bit of hardware: leashes, wax, deckgrips etc. The surfboard and clothing selection is also growing. Most of the shops offer board repairs, they are often great value and of good quality. What about clothing, what will I need? Morocco is a liberal Muslim country, and men and women are welcome to wear shorts and T-shirts. Swimming costumes and bikinis are normal on the beach but it is advisable to cover up your arms and legs a bit when walking around town. Shorts, tees and flip flops are the norm. Trousers and jumpers are sometimes needed particularly in mid-winter when the evenings can be chilly so warm clothes are a good idea during that period. What food can I expect? Our food is fantastic! The food served in all our venues is amazing. Our chefs will prepare a mixture of Moroccan and international dishes each week. For stays at Amouage, Taghazout Villa and Villa Mandala breakfast is included in every service option. All packages, apart from B&B, include a packed lunch. Please see the table above for what is included in each service option. Stays in apartments are self-catering. Bath towels but not beach towels. Please bring your own beach towels. Alcoholic drinks can be legally served and sold throughout the country. Morocco even produces its own range of wines and beers. We now have a fully licensed bar at Amouage. We understand that some people have special requirements. Let us know in advance, and we’ll do our best to make sure we have exactly what you need. All guests should be aware that not all ‘specialized food alternatives’ are available. Do I have to rent a whole room? No, but you can if you want. Prices shown on our site are “pp” – per person sharing a twin room (same gender) or a double with your partner. This means if you’re on your own you share the cost of the room and make a new friend. You can of course book the room to yourself as a private for an additional single room supplement if you prefer, please enquire. It’s really up to you. You can dine on one of the terraces overlooking the surf and enjoy a drink under the stars, get comfy in the salon and watch a film, go and have a mint tea in the village and check out the scene in this bustling little fishing village or we can arrange taxis for those who fancy checking out Agadir’s nightlife! What voltage and plugs do you use? Morocco is on 220 volts with two-pin round plugs. You can arrive at any time. It is not always possible to have your room ready before 2 pm. If you do want to arrive early and your room isn’t immediately available, start enjoying yourself anyway – we’ll take care of your bags and get you started on whatever service you have chosen. Check out is officially 12 pm, but if you would like a later checkout, let us know and we’ll do our best. Please be aware that if you supply the wrong arrival or departure details and we send a transfer this will count as your transfer. Please note that free transfers are only available from Agadir airport (if staying with us for 7 or more days on a package). If you would like to be collected from a different location, including Agadir bus station and hotels, please make sure you book this through the Customer Portal. What is it like to drive in Morocco? (Apartment stays) We provide airport transfers to and from the airport. From then on you have a hire car at your disposal for the rest of your stay. Please ensure you have the original of a valid EU driving license which must have been held for at least one year. The law insists that you always carry your driving license and car hire documents with you when driving in Morocco. Seat belts must be worn at all times and you must not use your mobile phone whilst driving (a finable offence). Police and Gendarmerie checkpoints are based every few kilometres along the routes. Minor infringements will result in your having to make an on-the-spot payment. In Morocco, as in Europe driving is on the right. The main roads around Taghazout are good. In addition, when driving in Morocco, we advise you to drive slowly and carefully as the roads are generally narrower and may sometimes have bumps and potholes, especially after periods of rain. We do ask that you take particular care when driving, bearing in mind the conditions of your hire car rental agreement. Please bring roof-straps if you have them. No vaccinations are required for visitors to Morocco and anti-malarial precautions are not necessary. We have first aid equipment along with staff trained in administering first aid. In the case of an emergency, there are hospitals and clinics in Agadir. Medical charges will apply according to the treatment received so make sure you have travel insurance before you arrive. There is a well-stocked pharmacy in Taghazout which is open every day. In our experience, Morocco is a developing country which offers different foods, water, bacteria and climate that you may not be used to. By taking some sensible precautions, you can help reduce the risk of getting an upset stomach which often occurs when travelling to any new country. Some guests have found that taking probiotics before travelling has helped to prevent gastro related illnesses. However, please do not start taking any new supplements before seeking medical advice. We also highly recommend that you bring your reusable water bottle to use our safe, filtered water provided at all of our locations. If you are pregnant, have any conditions or illness, or generally concerned, we recommend you get in touch with your GP for advice before you travel. Please note our advice is not intended to be a substitute for professional medical advice, diagnosis, or treatment, and does not constitute medical or other professional advice. We recommend you do not drink tap water at all in Morocco, even in hotels, as it contains much higher levels of minerals than the water in Europe. For local people, this is not a problem as their bodies are used to this and can cope, but for travellers from places such as Europe, drinking the tap water will usually result in illness. We do sell glass-bottled water for 30 dirhams at our locations to help eliminate plastics bottles. For just 10 dirhams (less than ￡1/€1) per day, you do have unlimited use of our water fountains to refill your water bottle. This water surcharge will be added to your bill at the end of your stay. Agadir airport transfer are free? Yes! We provide free Agadir group transfer for surf package stays over 7 nights. We collect groups of up to 8 in each vehicle. On occasions, it may be necessary to wait for flights landing at similar times ( up to 30 mins ). Solo Travelers - do you get any? We get a lot of people who visit Surf Maroc on their own and have a brilliant time – bookings for solo travelers and groups is roughly a 50-50 split. 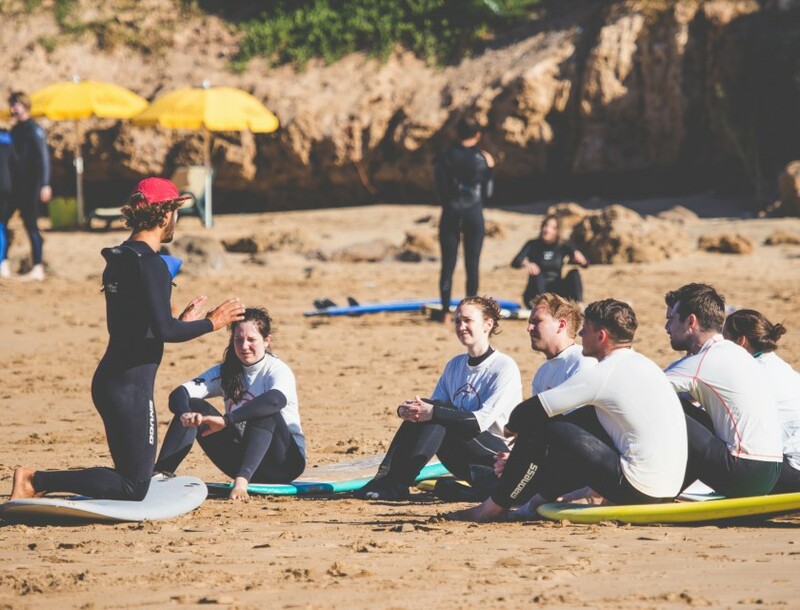 The set up at all our locations and within our surf services allows for such a truly social atmosphere that you’ll be making new friends in no time. Can I join the surf groups if I am staying as B&B? If you haven’t pre-booked one of our surf packages, and are staying in B&B, but you’d like to go surfing please let your host know by 1 pm the day before. We will do our best to accommodate you. Please note that during high season, we can’t guarantee there will be space in any of our vans. Please note: All Prices are "pp" - per person as shared room options (see rooms). Same gender sharing as standard in twins (solo travellers) or with your friend. Double rooms with your partner as a couple. This means if you’re on your own you share the cost of the room and make a new friend. You can of course book the room to yourself as a private double if you prefer, this incurs a single room supplement (please enquiry). The Best Room at the Amouage, is a double room only, so booking as 1 person the single person occupancy will be charged at a two-person Room Only rate. Please note; Room Only package has limited availability. Check our T&Cs for more details.